This is the first new add-on in 2018 I posted. Thank you again this year! This set includes EMUs used in various parts of the USA. I recommend it to your map's electrified railway. This set includes electric locomotives active around the world. *This set includes 24 kind of colors of locomotive. This set is based on high-speed trains running throughout the UK. These are using "PlayerColor", so you can freely change the color of the vehicle. I recommend it to your map's express train. To create these add-ons, I referred to the information taught by Lewis. This set include the fastest train in Taiwan. I recommend it to your map's high speed train. To create these add-ons, I referred to the add-on created by Takamaro. This set includes add-ons based on the "KTX" and "SRT", Korean high speed trains. *I am looking forward to Pyeongchang Paralympic Games too! This set includes add-ons based on tramcars "VarioLF", low-floor tram which modernized Tatra trams. This set includes add-ons based on tramcars "UltraLowFloor(ULF)", one of the most lowest floor trams in the world. I tried to make tramcars add-on this time too. This set includes add-ons based on tramcars made by"Škoda", active around the world. 03T "Astra", 06T "Elektra", 10T "Elektra", 13T/14T/16T "Elektra",19T "Elektra"
15T "ForCity Alfa", 26T/28T "ForCity Classic", 29T "ForCity Plus", 30T "ForCity Plus"
This set includes add-ons based on tramcars in Egypt. *Because data is very short, most of the specificaions of these vehicles are fictitious. If you know more detailed specs, please let me know. This set includes "stadtbahn" EMUs in Stuttgart Straβenbahnen AG(SSB). I recommend it to your map's urban transportation and metro. This set includes add-ons of "Vibrant Express(動感號)", high speed train in Hong Kong. I updatd an add-on set "Type-EMU_China-CRH_CR" newly. Please see this for details. This set includes EMU trains in Wellington, New Zealand`s capital. I recommend it to your map'ssuburban transportation. DM / D "English Electrics", EM + ET "Ganz-Mavag", FP + FT "Matangi"
This set includes lot of unique trains in New South Wales. A set "Waratah", B set "Waratah", M set "Millenuium", H set "Oscar", T set & G set "Tangara"
620 Class & 720 Class, "Endeavour", "Hunter"
This set includes Tenuki Sharyo's original high-speed trains. I made five kinds from double decker train to "Maglev". This set includes Tenuki Sharyo's original add-on based on diesel locomotive around the world. I recommend it to your map's non-electrified line. This add-on is based on "Tigress" high speed train series, official add-on of pak64. To create these add-ons, I referred to the add-on created by Hajo. *This add-on overwrites the official add-on. If problems arise, I`ll delete this add-on. I added same length("length=8") add-on as the base created by Hajo. This is the first new add-on in 2019 I posted. Thank you again this year. This set includes Tenuki Sharyo's original electric locomotives. I made five kinds from high power freight locomotive to high speed passenger locomotive. I recommend it to your map's various applications. This set includes Tenuki Sharyo's original EMU of metro. 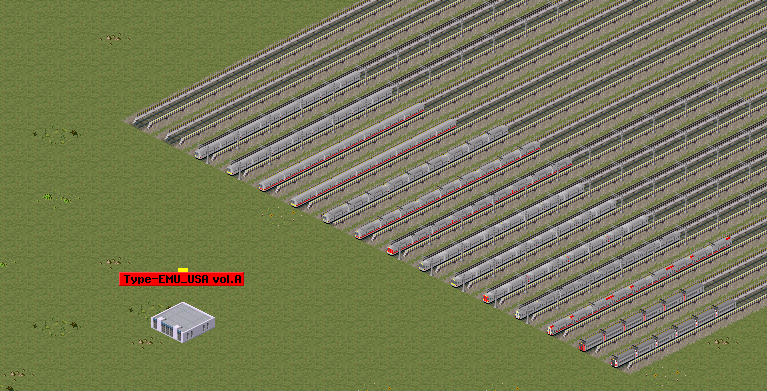 I made 8 kinds of high capacity trainset. I recommend it to your map's crowded metro. This set includes add-ons based on tramcars "Eurotram" and "Citadis 403", near-futuristic low-floor tram. I updatd an add-on set "Stuttgart Stadtbahn Set" newly. This set include a new key transport artery in Ethiopia and Djibouti. I recommend it to your map's new long distance railway. These look excellent! If only I could made stuff to this standard. These add-on that is written “copyright = Tenuki” is possible to modification and diversion except for commercial purposes excluding "Dojinshi" ! However, please write down that you made reference add-on I made when creating it. This set includes "Talgo", the high speed and variable gauge train developed in Spain. I recommend it to your map's high-speed and long distance train. This set includes add-ons M62 diesel locomotive series that mass-produced for Eastern Bloc and other countries. They were made using "PlayerColor", so you can freely change the color of these locomotive. I recommend it to your map's long distance train and freight train. I updatd an add-on set "Type-Talgo Set" newly.